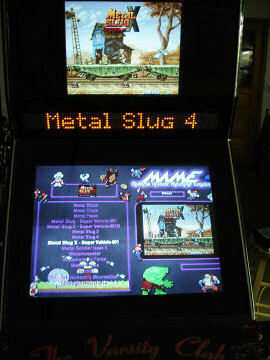 The Massive Mame Project: Home of the Mamey! This is the Superbowl of the MAMEYS. This category encompasses all aspects of the cabinet. From aesthetics, to functionality to originality. This category now includes cocktail and upright cabinets. The judge's comments, good and bad, are provided to allow for improvements and other points of view. Do not take anything personally. Hey, you can't please all of the people all of the time! Congratulations to all the winners, from the judges and the fans who will benefit from your hard work and genius! If YOU have something that you think is unique, use the e-mail link on the intro page. Zakk: EVERYTHING is custom made on this, it just blows my freakin mind. If I had two spare years of my life with nothing to do, I'd try to duplicate this piece of perfection. Bravo!!! 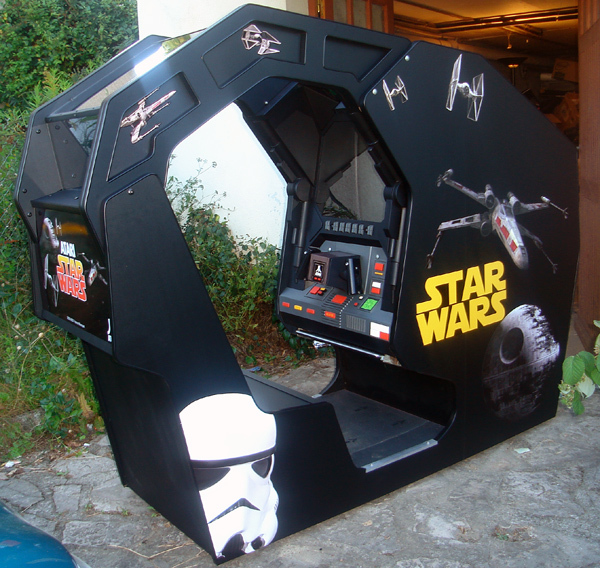 leapinlew: I love this cabinet. I love the attention to detail and the fact it's all custom. markrvp: Yes, it's a very nice reproduction. DrewKaree: I vote "I messed my pants"
Zakk: I voted no simply because I didn't like the panel artwork, and the frankenpanel approach. I DID like the multiple screens, and his wiring job was some of the finest I've ever seen. Stingray: McCoy's is the most innovative I've seen in a long time. I don't care for the sports theme, but that's because I don't like sports for the most part. I think he did a good job on the artwork, and I'm not about to hold the fact that I'm not a football fan against him. I'm not nuts about translucent buttons either, but again, that's just a personal preference. I do think they fit in well with the rest of this cabinet's bling factor. I love the dual monitor and LED display. Those alone make this cab worth considering. As pointed out, he did a top-notch wiring job, the inside looks very clean. markrvp: This is the finest constructed cabinet of the year. It has some really neat innovations including a secondary monitor that plays attract videos of the game currently highlighted in the front end. It has one piece of plexiglass that has been shaped to cover both monitors and the marquee. The plexi was masked and painted as well as having speakers cut into it. 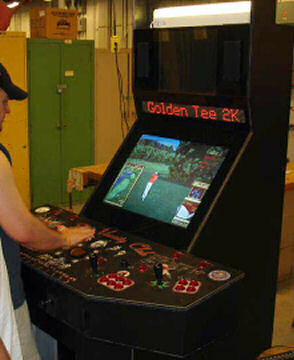 It has an LED sign that automatically calls up the name of the game currently selected. 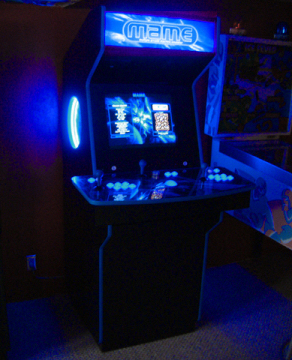 It uses all lighted leafswitch buttons with Lightmite LED boards, 4 - 49-way joysticks, LED light controller, etc. The wiring, construction, and everything else is top notch. The artwork is well done and consistent throughout. DrewKaree: Me like. Look good. Zakk: I just loved it. The lighting just puts this over the top. Well laid out control panel, nicely coordinated scheme, and portholes makes this one of the best cabinets I've seen to date. 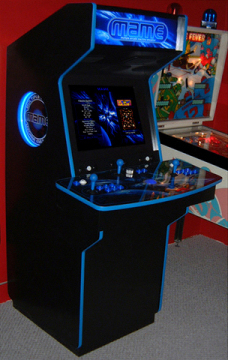 Stingray: There just really isn't anything I don't like about this cab, even his use of the MAME logo, which I ordinarily consider to be blah at best. markrvp: It looks good because every aspect of this cabinet has been carefully crafted for maximum impact. It is a sleek, efficient design. The controls are effective and not over-the-top. The artwork is complimentary throughout, and the lights give it a WOW factor that other cabinets do not have. DrewKaree: My vote would be NO for cab, YES for mods. They're definitely groundbreaking mods on a VERY nice but non-groundbreaking cabinet. missioncontrol: I voted NO on it because the thing is a (rather) huge neon light fixture. The side art is nothing original. Now the lighting is original but it's (not so good) in my opinion. It's supposed to be played, not a year round Christmas Tree. The cabinet is black with blue molding...big deal been done to death. The control panel artwork is nice but (I don't like the lights).